To the Southwest of Gabbiadano lay another, similar village, Rosucci. Zinnsburger filled the woods atop Monte Bartoli with Grenzers, deployed his infantry, around Gabbiadano, and his cavalry, divided into two commands, behind Rosucci, and waited on the Spanish to advance. The battlefield viewed from the West. With his every move being harassed by Austrian irregulars it took Panos until the sun was directly overhead in a cloudless sky before he was ready to attack. His infantry was on the right, supported by the four dozen heavy cannon he'd brought along to help reduce Austrian fortifications. On his left he deployed his cavalry. As a result of the two armies' deployment, foot facing foot, horse facing horse, two distinct battles developed. Whereas at Gollerwitz it was the discipline and training of the Prussian infantry that proved decisive, at Gabbiadano, it was to be the elan of the Austrian cavalry especially the three brigades of Cuirassiers under Loudon that determined the outcome. The Austrian right (foreground), and center. A little after noon, the artillery on the Spanish right crashed out and immediately began taking effect on Aschauer's infantry to their front. Seeing, the roundshot ploughing through the Austrian ranks, Corredera impetuously led his infantry forward to follow up, but was recalled by Panos who wanted to wait until the enemy were well and truly wavering before delivering any assault. The Spanish artillery tears at the Austrian center. At the other end of the line, the Spanish cavalry began to advance on either side of Rosucci and were immediately counterattacked by Loudon's cuirassiers. To the West of the village, the Austrian heavy horse scattered a brigade of Spanish dragoons, to the East they threw back a brigade of heavy cavalry. By 13:00 the Austrian squadrons were continuing to drive back their opponents. At the far end of the line the Spanish guard cavalry had been committed, but they too were in retreat, and Panos was forced to take time away from admiring the holes his guns were continuing to tear in the Austrian infantry, to ride over to his left and try and get things there under control. 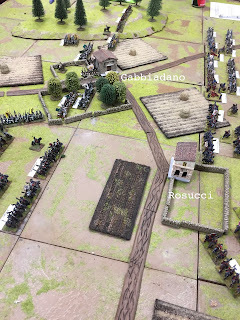 Arriving East of Rosucci and surveying the scene, he promptly ordered Paredes to send two brigades of his second line over to the gap between the village and the orchards West of Gabbiadano where the Austrian cavalry was threatening to break through. A counterattack was also mounted by Hermoso's two brigades of Heavy Cavalry, and they managed to drive back the Austrian cuirassiers East of Rosucci. 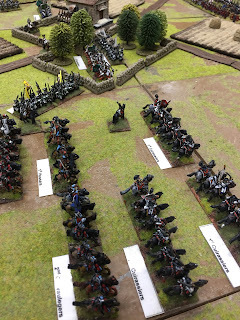 Spanish infantry are moved up from reserve. Loudon's cuirassiers drive back the Spanish guard cavalry. 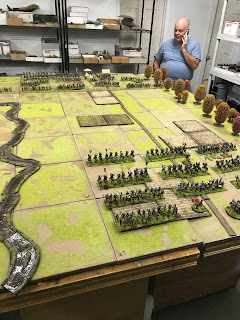 Sometime after 14:00 Zinnsburger, observing the pounding Aschauer's infantry were taking from the excellently handled Spanish guns, ordered them to fall back out of range, then sent word to Loudon to redouble his efforts on the right, and for Pfeiler to move up in support. Spanish infantry watch their batteries pounding Gabbiadano. 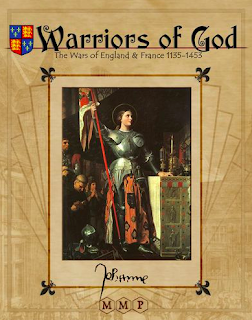 The cuirassiers charged again, and the Spanish guard cavalry were driven back behind the village, only the incredible example of Latorre, leading from the front, sword-in-hand, and heedless of danger preventing the battered guardsmen from routing. Pfeiler's chevaulegers, on the other hand, could make no headway East of Rosucci, and were repulsed by Hermoso's Spanish heavies. This greatly encouraged Panos, and he ordered Paredes' two reserve infantry brigades forward to exploit the advantage and clear the Austrian infantry out from the orchards where they otherwise could enfilade Hermoso's victorious squadrons. 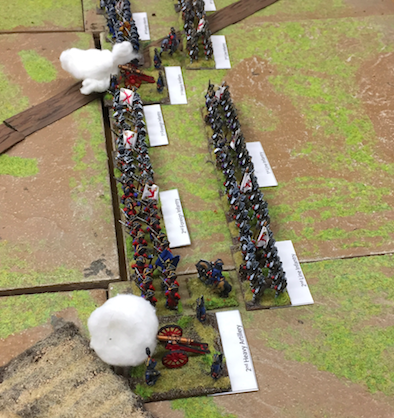 The order had barely gone out however, when the guard cavalry began streaming back past Panos' position closely followed by two brigades of Austrian cuirassiers moving rapidly into the left-rear of the Spanish army. At this sight, Panos lost his nerve completely, and at 15:00 he ordered a general retreat. This was swiftly turned into something of a rout by Pfeiler's completely fresh brigade of hussars who harried the Spanish army back the way they had come. In three hours, and for the loss of 1,440 men Zinnsburger had won a decisive victory. Spanish losses, including the pursuit amounted to some 4,000, and it was with the greatest satisfaction that Maria Theresa would receive the news of the outcome of her erstwhile allies' perfidy.